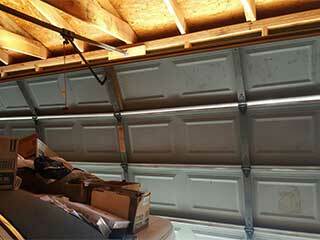 Our team specializes in all sorts of garage door related services. One of the key aspects of what we do is regular maintenance. This type of service allows us to essentially nip major problems in the bud and prevent a lot of issues from affecting the performance of your automatic system. This does more than save you money; it also allows the door and its various parts to keep working properly for a lot longer. In order to see to it that the system remains safe to use, our team will test the opener's reversal feature. This involves checking the alignment of the photoelectric sensors that this motorized unit uses to keep it from closing the door while there's an object, or a person, under it. If we find that realigning the sensors is required, we'll perform it on the spot. We'll also check the motor gear and the interior circuit board to make sure that they too are performing properly. Steel rollers, torsion springs and hinges are some of the different parts that can greatly benefit from being lubricated on a regular basis. In fact, if they don't receive this type of treatment, they will suffer from more wear and tear, and won't be able to last as long. Remember; when one part breaks down, other parts of the system also suffer, due to collateral damage. That's why making sure that every component is fully operational is very important. Although you can always call our team at Garage Door Repair Cedar Hill to schedule a maintenance appointment, nowadays there's an even better alternative. Use our online system today and book yourself an appointment. Our technicians will see to it that your garage door keeps working flawlessly for as long as it possibly can.